(Natural News) Acupuncture helps normalize uric acid levels, reducing the risk of gout and kidney damage, according to a study published in the Journal of Traditional Chinese Medicine. Carried out by a team of researchers from Beijing University of Chinese Medicine, the study investigated the effects of acupuncture therapy at specific areas on serum uric acid and xanthine oxidase levels in a rat model of gout and hyperuricemia. In conducting the 90-day experiment, the team used fifty rats and divided them into five groups: blank, model, Shu-acupoint, Yuan-acupoint, and Mu-acupoint groups. 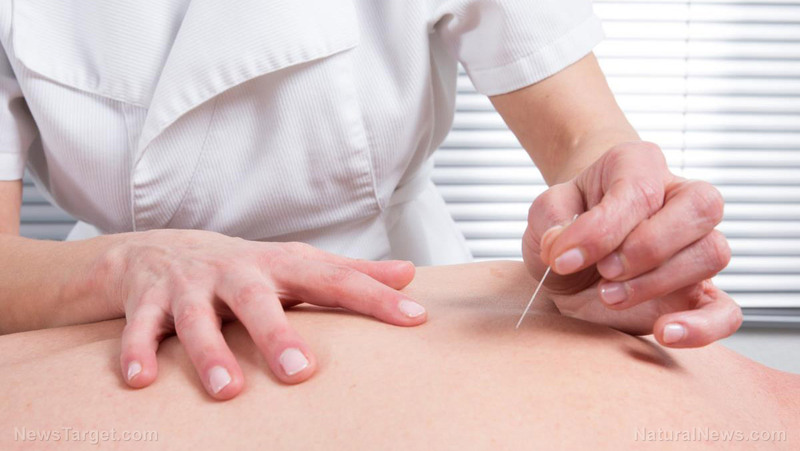 The groups that received treatments underwent three courses of acupuncture, with each course involving a total of 10 interventions and each intervention lasted for 15 minutes. Moreover, there was a pause for 10 days between courses. The researchers measured the serum uric acid and alkaline phosphate levels with the use of an automatic biochemical analyzer, while they evaluated xanthine oxidase with the use of immunofluorescence. Results showed that serum uric acid and xanthine oxidase levels in the model group were greatly higher and the renal index greatly improved when compared to the blank group. Moreover, the three treatment groups had lower serum uric acid and xanthine oxidase levels and improved renal index, in comparison to the model group. Known as hyperuricemia, a high uric acid level is an excess of uric acid in the blood. Uric acid is made when purines, which are found in certain foods and also formed in the body, are broken down. After uric acid has been produced, it is transported in the blood and goes through the kidneys, where most of it is filtered out into the urine. Usually, a high uric acid level occurs when the kidneys do not remove uric acid in the body properly. Hyperuricemia may be a result of water retention relievers, excessive consumption of alcohol, genetics, hypothyroidism, immune-suppressing drugs, niacin or vitamin B3, obesity, psoriasis, purine-rich diet, such as liver, game meat, anchovies, sardines, gravy, dried beans, peas, and mushrooms, renal insufficiency, and tumor lysis syndrome. Hyperuricemia may lead to a variety of conditions, such as metabolic acidosis, gout, and kidney stones. Gout is the most common and one of the most painful side effect of having a high uric acid level in the blood. Metabolic acidosis develops when excess uric acid is present and cannot be properly excreted. It may result in rapid breathing together with confusion and lethargy. It may even cause shock and death. Moreover, kidney stones are formed when uric acid crystallizes in the kidney and is stored there, forming different sized stones. These stones can get trapped in the ureters when a person tries to urinate, causing severe pain. Other side effects of hyperuricemia include lead poisoning, diabetes, leukemia, kidney disease or renal failure, and toxemia in pregnancy. If you’d like to read more news stories and studies on traditional Chinese medicines, you may go to ChineseMedicine.news.